“We’re very fortunate to be in the position that we are able to help these K-9 units. The work that is performed by the dogs and their handlers as well as the bond that is formed is incredible. 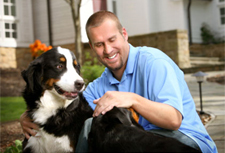 We’re just thrilled to do our small part.” — Ben, on the mission of his foundation. 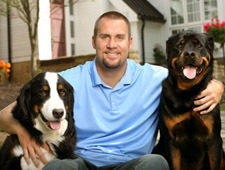 Today, Ben announced the fifth grant of the 2011 season from The Ben Roethlisberger Foundation at The Giving Back Fund. The foundation will be distributing a grant to the Norwood Police Department just outside of Cincinnati, OH where the Steelers will play the Bengals this Sunday, November 13th. The department is seeking financial assistance to purchase training and safety equipment for a canine and training for the handler. Mike Wallace, Brett Keisel, LaMarr Woodley, Ike Taylor, Troy Polamalu and Antonio Brown also made his team! You can check out the rest of his picks here. Earlier this month the Steelers and CASA (Court Appointed Special Advocates) of Allegheny County teamed up to host a dinner for 250 kids thanks to offensive coordinator Bruce Arians, whose wife Chris is a CASA volunteer. Ben, Mike Wallace, who is the Honorary Chair, and Antonio Brown attended the dinner. You can see a larger version of the photo from the dinner here. “Dalton has come in and done a great job. I thought he was one of the better quarterbacks coming out last year. He has done a great job of making plays. “He played really well in a pro style offense where it wasn’t look to the sideline for every play and let the coach check. He is a good quarterback and he is making good plays and taking what the defense gives him. He can make plays outside of the pocket. He is quick enough and fast enough to get away from the rush. He can throw well on the run. Doesn’t have a monster arm but he has good timing with his throws, he can get the ball into tight windows because he anticipates guys being open.” — Ben, on Cincinnati Bengals rookie quarterback Andy Dalton.